Load Shift Accidents | Nashville Truck Injury Lawyers The Law Offices of John Day, P.C. Unsecured, overloaded or poorly secured loads can shift during transit causing significant accidents. 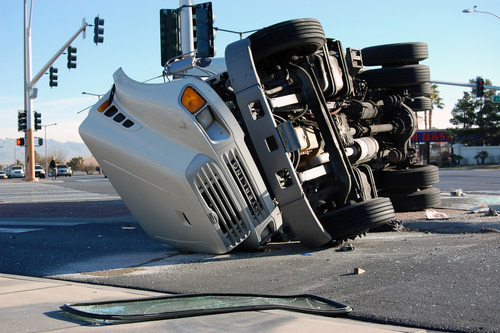 The shifting load can alter the truck's center of gravity resulting in a roll-over accident or jack-knife accident. And even if the truck makes it safely to its destination, the shifted load can be incredibly dangerous at the unloading dock. For example, at the Law Offices of John Day, our truck lawyers have successfully represented a truck driver who sustained serious crush injuries when he opened the doors to the trailer and an improperly secured load fell on him. The Federal Motor Carrier Safety Administration mandates load securement protocols but these regulations are often violated, and the violations can cause serious or deadly accidents. To prevent a load shift accident, workers must be properly trained on the regulations and their implementation. In addition, proper securement devices must be provided. The regulations permit chocks, wedges, cradles, dunnage bags, shoring bars, tie-downs, steel strapping, chains, wire rope, cordage, synthetic webbing, etc, but all too often the proper securement devices are not provided or they are not used properly. Further, the regulations require all vehicle structures, systems, parts and components used in the securement of cargo to be in good working order, which requires regular inspections to check for damaged or inoperable components. Unfortunately, some drivers and employers choose to omit these critical inspections for the sake of saving time and increasing profits. At the Law Offices of John Day, our award-winning lawyers represent all types of victims of load shift accidents including the general motoring public, truck drivers and dock workers. Regardless of whether the accident was caused by improper training, defective equipment, etc., we can help you hold all at-fault parties accountable and get you and your family the compensatory damages and, if appropriate, punitive damages, you deserve. We understand the safety regulations and we know how to prove a violation. Our truck accident attorneys also work with highly-qualified accident reconstruction and engineering experts to help win your case. If you or a loved one has been hurt in a load shift accident, contact us online or call us at 615-742-4880 or toll-free at 866.812.8787 for a free, no-obligation consultation. One of our trucking lawyers will sit down with you, answer your questions and advise you of your rights. And because we only get paid if we win and we advance all case expenses, you are never out of pocket any money to pursue your load shift accident case. But, the law only allows a limited time for you to pursue your rights so do not delay.